Boost News is our fortnightly email newsletter. It’s our way of sharing what we’ve learnt as Agile coaches and trainers, as web and app developers, and as a freedom-centred workplace. 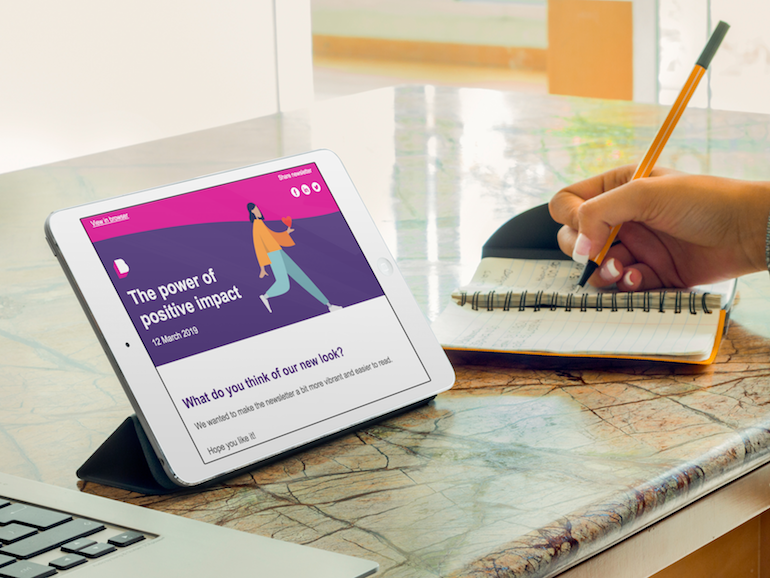 Boost News offers Agile tools and tips, case studies on developing digital tools that get you closer to your customers, ideas for making your organisation work better, upcoming events, and anything else we think will help you make a bigger impact. Plus you’ll get the latest on what’s happening here at Boost HQ. If you want to learn more about anything covered in the newsletter, or you have feedback or suggestions, please contact us. Discover the secrets of effective acceptance criteria, watch the magic of one piece flow in action and find out what the Nielsen Norman 2019 Best Intranets report has to say. This issue of Boost News is all about making changes for the better. Learn how Wellington has changed over the past 100 years, how changing the amount of work you have on the go can power up your productivity and how changes to the government DNS platform affect state agencies. Plus, say bonjour to the latest Booster. What can Product Owners learn from Pixar? Find out in our new-look newsletter. Plus, check out our new one-stop shop for Product Owners, meet our Agile coaches, and learn when Ruby on Rails is right for you. 27 February 2019 – Have you secured development resource for your project? Learn about the planning support and discovery workshops that Boost can provide for your next software development project. And find out how you can lock in the resource you need. What happens when Marie Kondo meets Agile? Find out how to create a product that sparks joy. Plus, get case studies on reducing batch size and nailing next-level Agile practice, and learn how to take your career global. Find out how to make your data work harder by building a single search tool. Learn about the developer role we’re looking to fill and meet the newest Booster. And, crucially, find out how to avoid Valentine’s Day disasters. Find out how to get your product to market faster by shrinking your batches. Plus, learn the tricks US fighter pilots use to get to sleep anytime, and Google Ad Grants — are you eligible? Learn the secrets to delivering successful projects with Agile, get our top 3 resources for 2018 and review the new web standards. Our Christmas newsletter includes a bunch of festive goodies. Find out how you can make work more rewarding and less risky, and learn what makes Product Owners happy. Plus, discover the top Christmas movies and songs, and find out what charities really like you to donate when you want to spread Christmas cheer. Learn how to supercharge your brainstorms, visualise and manage risk, and get discounts on Agile training. Plus get your copy of our new one-stop guide to being a Product Owner. Discover how to use Agile tools to get the transparency you need to deliver quality and value. Learn what we need to do to keep algorithms and AIs fair and transparent. And find out what’s happening with a popular service that helps kids with their schoolwork. This issue includes a case study on reducing project risk, a way to grow employee engagement and tips on procrastination. And there’s also news on exciting awards we’ve won. Woo hoo! Learn how you can get more value from your projects with less risk. Plus, find out how the GLAM sector can get more exposure and nonprofits can get more donations. Find out how to leverage what you learn. To this end you can check out an Agile review and a case study on adapting to change and revolutionising research. Also, we share some lessons from kitchen catastrophes. Learn how Lego led our strategy session, how The Spinoff recommends you find cool Kiwi content, and how Google came to conquer the world. In this issue, Dave Snowdon brings complexity theory to management, Otago Museum brings space to school and coaches bring serious games to Agile training. Learn how to win with accessibility and wow crowds at conferences. And find out how to have fun on Instagram and guide your team without giving all the answers. Find out why the Life Education Trust is training food detectives, where Facebook took “move fast and break things”, when smaller is better and how to multiply your impact. Read about saving money on development, an exclusive leadership workshop, gauging success the Agile way and new crew at Boost. In addition, get Jacinda Ardern’s take on creative communities. What to do before and after your project Kick-off, how to make your brain work better, taking your Agility to the next level and who was best at picking the FIFA World Cup, humans or AIs. How the EU’s GDPR data privacy rules will affect us in NZ, helping Kiwis thrive with MSD’s Check What You Can Get tool, and the NDFNZ conference, and a new Auditor-General report. Also, the benefits of learning Agile in a working Agile studio. This issue of Boost News is all about, well, news: new vacancies, a new user story guide and a new face joining the team. Plus learn about Google’s free G Suite for nonprofits. Jacinda Ardern recently launched the results of work Boost has done with CreativeNZ. Learn about this, product discovery, choosing Cloud providers and how to buy happiness. A new job vacancy at Boost, happiness hacks from neuroscience, how to work with stakeholders in Scrum and July’s ITx conference. And a look at Artificial Intelligence in New Zealand. Meet the new Boosters, find out how to build a better team with a Team Charter and learn the secrets of Boost’s netball success. Plus see what’s happening at TechWeek NZ and check out the latest State of Agile report. Learn what winning WorldBlu certification means to us, how NGOs can save money on IT and when having more than one Product Owner might work in Scrum. Plus check out Boost’s top blog posts of 2017. Build successful Scrum teams. Use blockchain to create trust. Compare our Agile training options. Learn what’s happening with the new government IT Marketplace. Find out how you might be able to get a free project kick-off workshop. And get your own DIY kick-off workbook. In this Boost News: State of the Cloud report, how to access Kiwi content free, Google Design Sprint Facilitator’s Handbook from Sprint book author Jake Knapp. On top of that, our practical Scrum primer series kicks off. View a new report on how the nonprofit and NGO sector in NZ and Oz can make best use of digital technology. Also, learn about training for public sector leaders available from the government’s Leadership Development Centre. Product discovery resources, how defining your organisation’s purpose delivers results, the NZ Government Digital Service Standards, and more. Want to ramp up the impact you have? The latest issue of Boost News looks at how to increase your impact through things like Agile training, choosing your clients, public good projects and asking three key questions before running a Google design sprint. Check out our Google design sprint case study on the official Sprint Stories website. This issue also has tips for using human psychology to design UIs that users love. You’ll also find out about ways your dev team can work together today to save time and money tomorrow. The first issue of Boost News for the New Year focuses on new tools. Among these tools is a new SEO guide from Google and a case study on how to test if a new idea will work. And we also look at ctags, a tool to help developers save money by speeding up debugging complex code bases. In the celebration issue of Boost News we check out Santa’s Agile scorecard. You’ll also get writing tips for content promoting your organisation and find out about Agile for teams doing industrial-scale work. On top of that, hear how Minister Clare Curran celebrated sites we built. This issue of Boost News talks about talking. You’ll get tips for video chats, an insight into the benefits of one-on-one meetings and a retrospective view of whole-company retrospectives. We also have suggestions for conference talks you might want to watch online. Find out how collaboration can turn your team into stars. There’s a range of practical tools, tips and demos. There’s also a case study on how merging organisations can unite their digital resources. And you’ll also find out how developers and product owners can work together to combat entropy in software. This issue focuses on UX or User Experience: how someone feels when they use something. Great products and services have great UX. But how can you learn what kind of experience your customers want, and how do you deliver that experience? Read a case study on how Harold the giraffe and his colleagues at Life Education found the Agile development process. You can also learn about the Te Papa digital skills panel. If you’re after Agile Training, check out which package suits your aims and experience.